“Blessed be the God and Father of our Lord Jesus Christ, who has blessed us in Christ with every spiritual blessing in the heavenly places, even as he chose us in him before the foundation of the world, that we should be holy and blameless before him. 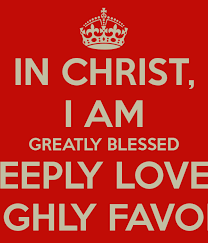 In love he predestined us for adoption as sons through Jesus Christ, according to the purpose of his will, to the praise of his glorious grace, with which he has blessed us in the Beloved. In him we have redemption through his blood, the forgiveness of our trespasses, according to the riches of his grace, which he lavished upon us, in all wisdom and insight making known to us the mystery of his will, according to his purpose, which he set forth in Christ as a plan for the fullness of time, to unite all things in him, things in heaven and things on earth. Last week the question arose in regards to my Blssdguy email address that I use for commercial non-solicitation purposes. Blessed in what way was the question? After I gave one of my smirk smiles and before I could answer, he began to ask: blessed with good health? Money? Family? Work? How are you blessed? My reply? I am blessed with a trustful relationship with the Triune God. Anything that comes from that relationship is secondary and frankly doesn’t rate as being known and knowing the Creator God. He is the source, the reason, and purpose behind life. Everything is known by Him. He shares his life with me and others. He lets us play in his worldwide sandbox. He wants us to explore, discover, and learn from Him. Through the challenges of life, He wants us to lean on Him and trust Him as He navigates us through the redemption maze. To know Him and to be known by Him in a favorite light is the greatest blessing one can receive in this life. What would it take for you to realize the same? Jesus is rooting for you! ← Is Money The Answer?